No surprises here. Sonic’s latest adventure is pretty much awful in every area. Gameplay is tedious, controls are floaty, framerate is bad and even the music is bland and forgettable. Sure the glitches are the kind that a gamer has to find but they are still plentiful and can easily interfere with the game. It’s a shame to because I really wanted the game to be good as it was the first Sonic game in ages to allow multiple playable characters, but I couldn’t stomach more than an hour of this slog. To this date it is now the worst selling Sonic game surpassing even Sonic Shuffle. Avoid this unappealing mess at all costs. Giving Sonic a sword to allow for super fast speed and hack N’ slashing gameplay? Good concept, terrible execution. Levels are now far too heavily focused on combat. Stripping away the loops and platforming that made the other games so fun, this game’s idea of challenge is just stuffing enemies throughout the level. The sword combat is also a complete joke. It’s not like Twilight Princess with fluid motion control, this is just bottom of the barrel waggle crap, and even worse the sword controls are clearly delayed. No joke, this game gave me serious wrist-ache. Some may enjoy the swordplay but I certainly didn’t. It killed off what could’ve been a decent game. The predecessor to Black Knight was not quite as bad but still pretty crap. Sonic now steers with extremely fiddly motion controls along levels that are too linear. All too often it feels like the game is playing itself. Also the RPG elements means that you have to unlock new moves for Sonic to control better. That’s nice, make the controls purposefully bad to start off with so you can unlock to make them better later? Don’t be daft. The game is slightly redeemed by a fun party mode which can be a good laugh with friends, but that’s not why you play a Sonic game, you play for the main quest, and the main quest in hand here is terrible. I can’t justify Sonic the Hedgehog being any higher than this. Here’s the thing, I actually quite like this game. I find most of the characters whilst slow feel powerful when defeating enemies (Shadow in particular), most of the levels are well designed and fun, the music is phenomenal and the boss battles are enjoyable. But unfortunately as this game was rushed glitches are ever present, not game breaking but certainly interfering. Dying also doesn’t always feel like the player’s fault due to certain elements of bad design. Still this game isn’t as terrible as people say it is, I think it’s really more the disappointment of what it could’ve been. For me it’s a guilty pleasure. I had my doubts about this game after first playing it at Euro Gamer. It introduces a lot of new ideas to gameplay which is either a hit or a miss. I appreciate how it tries to go back to the old days where you had to be careful through the levels and speed was something you earned by playing well. Also the Super Mario Galaxy-esque level layouts as well as the parkour feature allowed for some expansive level design. However the controls can feel quite floaty, some of the wisps feel a lot more gimmicky and it is generally a frustrating game. This game gets an A for effort, and an overall grade of C-, must try harder. I would’ve put Lost Worlds and even Sonic 06 above this, however I feel this game is overall better made. The main draw for this game is the team gameplay and being able to switch between a Speed, Flight and Power character at any time. This gave the levels more depth than the previous 3D Sonic games and allowed for a more dynamic style of play. However the repetition of playing the same levels over again with very minor changes could get quite tiresome, along with the terrible special stage controls and infrequent but frustrating design hiccups and glitches ultimately hurts the trust factor I have with this game. One last thing to say is the music is very good and I love the main theme. I remembered loving this game when I first got it, nowadays its showing it’s age. The general consensus for this game is that the daytime stages are fun and the night time stages are not. The daytime levels are fun, but the levels can be very linear and when actual platforming is thrown in loose controls and framerate drops sometimes come into play. The night-time levels are this game’s biggest controversy. These stages aren’t bad as they have some depth to them, they just lack speed and can be tedious brawlers. One other thing I like is how all the levels are based off different countries around the world. It is still a pretty good game, just not a very replayable one. Another game that is showing age, but has more of a fun factor than Sonic Unleashed. Sonic’s first foray into 3D actually worked out quite well. His levels are fast paced and fun, Tails and Knuckles also had enjoyable stages as well. However when other characters come into play trying to design the levels to work with different characters I think might’ve made things more tacky. I like the hub world and I liked the soundtrack, but I didn’t like playing as Amy or Big, as their stages were just too slow, tedious and don’t even get me started on Big’s fishing levels. If you still have time for Sonic’s old 3D adventures I do recommend going back to this one. For me anyways it’s still a good time. The game released to celebrate Sonic’s 20th Birthday is one that fans of both the old and the new should love. This game re-creates levels from Sonic’s previous adventures but now with 2D and 3D gameplay. It explores the levels in ways never seen before plus it plays sublime. I want to like this game more however there’s one big reason why it couldn’t place any higher on the list. It’s way too short. 9 levels with 2 acts simply isn’t enough and almost half of them are city levels, where’s the snow/ice or space levels? If you have the PC version you can enjoy various mods to increase the game’s lifespan. It is an awesome experience, but does still scream missed potential. Basically take the daytime levels of Sonic Unleashed only give us more to do. This game has more an emphasis on platforming rather than quick reactions, and the alien wisp powerups allow for some really out of the box level ideas. The levels already feel unique being set in an outer space amusement park and these fun creative powerups only add to the enjoyment, my favourites being laser and drill. This game also has by far the funniest writing seen in the Sonic series, I frequently found myself laughing at a lot of the in game jokes. It all amounts to a game which is hugely enjoyable to play. Yeah, I like Shadow the Hedgehog. Come at me! But in all seriousness I feel this game gets an unfair rap for being worse than it actually is. What’s cool about this game is being able to choose from different missions in the levels, so even though you have to play through the game 10 times the variety of missions means you never have to do the same combination of missions more than once to get all the endings. The gun combat made taking down big enemies fast feel so stimulating and the game has a lot of speed with obstacles being nothing a little care and thinking can’t overcome. The game isn’t perfect, the aesthetics aren’t great and some of the vehicles don’t help, but I feel people need to give this game more of a chance and not just follow what everyone else says. With the many different 3D styles Sonic has attempted the Adventure style is the one I crave the most, and Adventure 2 was the pinnacle in that regard. Having less styles of gameplay but more levels allowed for them to be designed better to suit their respective character, in that regard they are more fun to play through. I used to only play for the Sonic/Shadow stages, but I’ve even been finding enjoyment in the Shooting and Treasure Hunting stages as well. This game also has the most engaging story in a Sonic game that feels very cinematic. 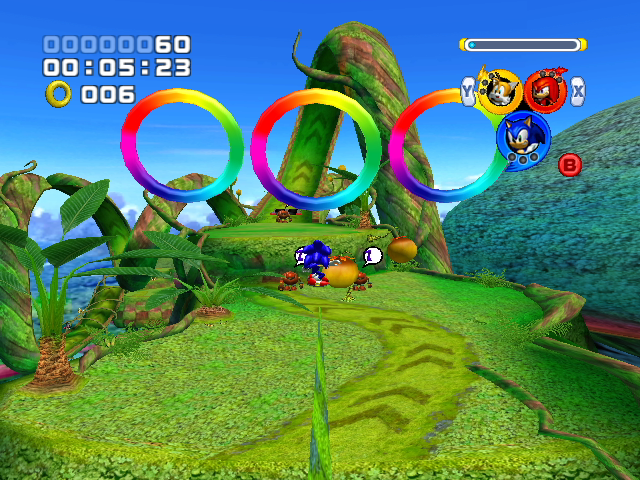 The Chao garden is also cleverly inter-weaved with the main gameplay to give more incentive to replay the levels. For these reasons Sonic Adventure 2 Battle has been the Sonic game I found myself coming back to the most in recent years and is now my favourite of Sonic’s 3D outings. So those are my opinions on how all the 3D Sonic games rank. Whilst you can debate until the end of time which style of gameplay suits Sonic better this is just my take on the games. Disagree? Then make your own list.